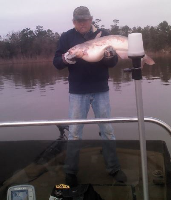 Thursday 11-30 - Lake Houston Fishing! Fished for about 3 hours this morning. Water temp started out at 62 and rose to 64. Water in good shape with level a little low. Bite was slow and very lite today. Managed 10 keepers with only 2 throwbacks. Fish caught in 10 FOW. until then...ill just keep taking pictures. You sure are on 'em WM! Sounds like a good day! Very nice ROI for only 3 hours of work. 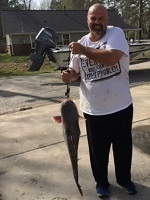 Sounds like the water is in good shape and if the weather holds up Saturday may be a good day to fish. Thanks for report. Shane the weather looks great tomorrow. Get out there, catch some fish and post some photos. Maybe the skiers and jet ski idiots will be out doing Christmas shopping tomorrow. One can only hope.